Position: Kitchen assistant, dishwasher, etc. 9th place in the renowned Bocuse d’Or 2003 culinary competition in France. Nominated as a contestant by the Icelandic Chefs Association. A nomination of this kind is one of the greatest honours a Chef can receive and I very much appreciated the confidence placed in me and being given this opportunity to compete on behalf of Iceland. Bronze medal in the Nordic Chef Competition in 2001. One of the most challenging culinary competitions in the world. The entrants are the Chefs of the Year in each of the Nordic countries: Sweden, Norway, Iceland, Denmark and Finland. Chef of the Year in 2000. The youngest Chef in the history of the competition to win, only 22 years old and just out of catering school. Trainer-Instructor (2000 – 2001) and one of the founders of the Young Chefs National Team of Iceland. 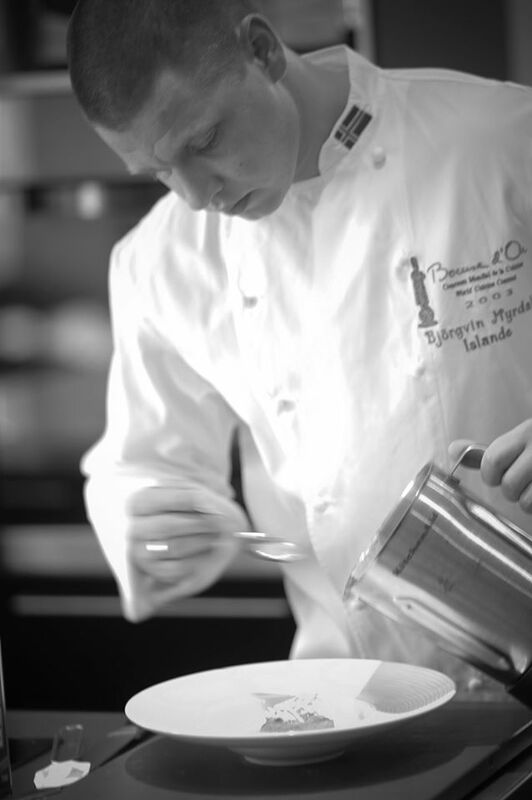 Assistant to Sturla Birgisson, the Icelandic competitor in the Bocuse d’Or competition in 1999. Competitor, assistant and/or jury member in many local culinary competitions 1996-2002. Member of the Icelandic Chefs’ Association 2001 and member of the culinary club Freisting (Temptation) in 1999. Chef for many official receptions and formal/gala dinners for the President of Iceland, Mr. Ólafur Ragnar Grímsson and the former President, Mrs. Vigdís Finnbogadóttir, hosting for instance the King of Norway, the Queen of Denmark, the King of Sweden, the President of Finland, the King of Jordan, the Prime Minister of Italy, the Prime Minister of Iceland, the Althing (the Icelandic parliament) and many others (1996 – 2002). Also many non-official birthday- and wedding celebrations.